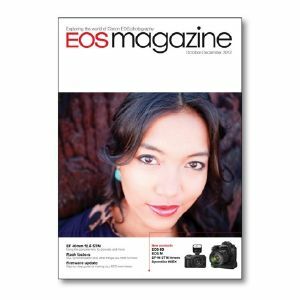 World of EOS Photographic projects and news from the world of Canon imaging, Canon at Photokina, Canon Cinema system, firmware and software updates for EOS-1D X and EOS 7D and Mark Davison writes about his experiences covering the Paralympics 2012. Creative Zone - Your EOS camera offers a range of shooting modes. Here is a guide to four of them. Flash Factors - When shooting with flash you often need to take note of the ambient light as well. Heres how. Masterclass - Leon Baas reveals how he shoots his close-up images of insects. Playback - Do you know how many different ways you can view and review images on your LCD screen. Standard Lens - Andrew Gibson puts the EF40mm f2.8 'pancake' lens through its paces. Firmware update - A step-by-step guide to downloading and installing camera and lens firmware. Q&A - Answers to your photographic queries.